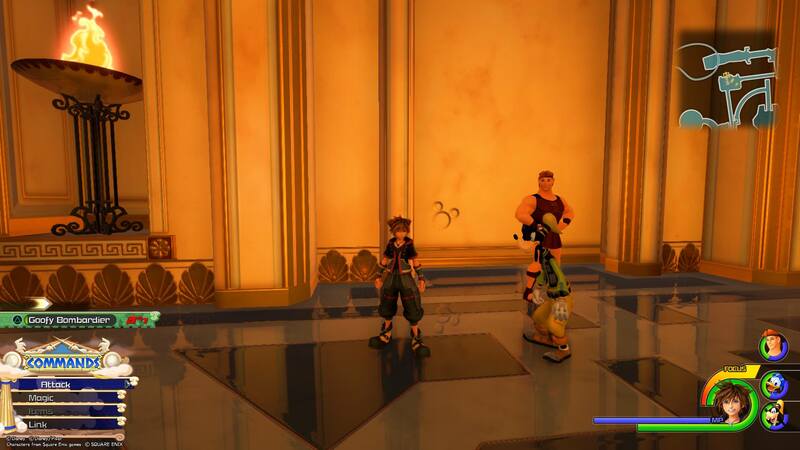 Where to find all 12 Lucky Emblems in the Olympus world of Kingdom Hearts 3. 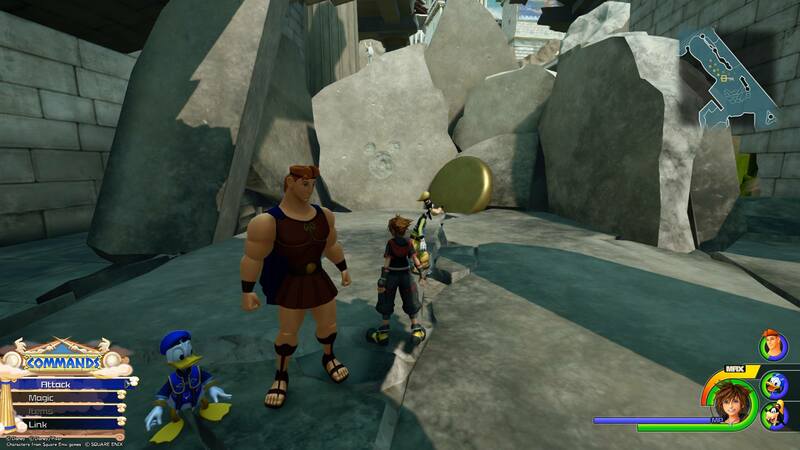 In Kingdom Hearts 3, players will need to find and photograph Lucky Emblems in worlds like Olympus in order to unlock the game’s secret video. Most of the worlds have around a dozen or so Lucky Emblems to find, with the exception of smaller worlds like Twilight Town and 100 Acre Wood. In Olympus, there are 12 Lucky Emblems to find in total. What’s interesting about Olympus is that players won’t be able to find all of them when they first play through the world. Instead, they’ll need to return again at some point in their journey in order to explore the newly restored city of Thebes. Struggling to find all of the Lucky Emblems in Olympus? We’ve got you covered! Below, we’ve put together a comprehensive guide on where to find all 12 Lucky Emblems in the Olympus world of Kingdom Hearts 3. 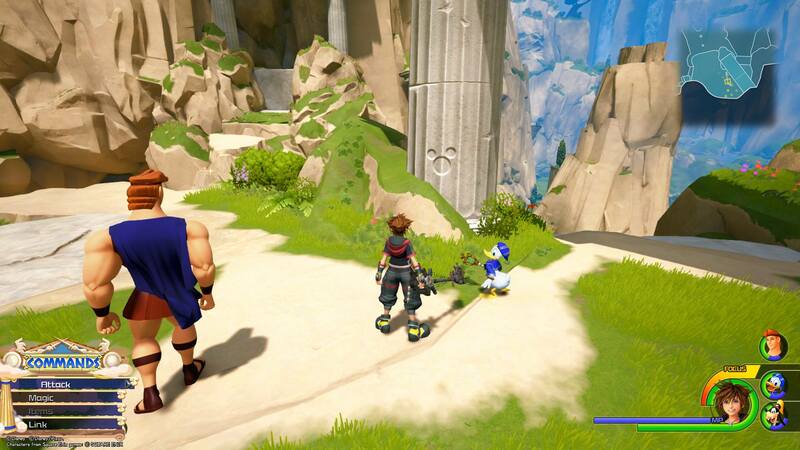 There are 12 Lucky Emblems to find in the Olympus world of Kingdom Hearts 3. 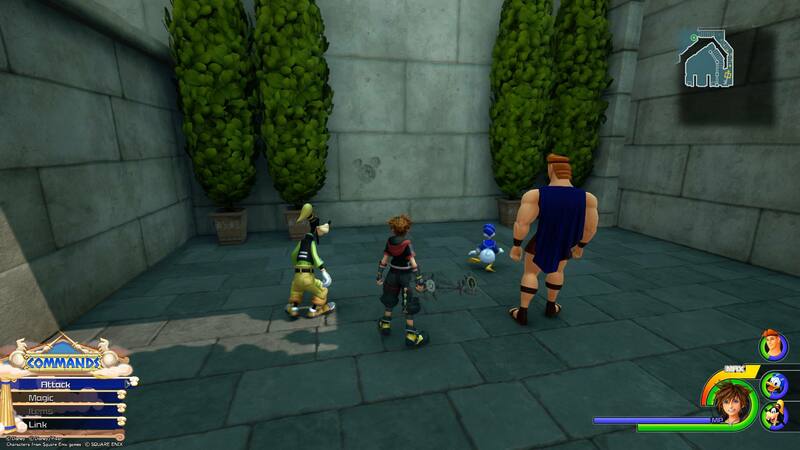 In the Olympus world of Kingdom Hearts 3, there are 12 total Lucky Emblems to find. To photograph them, you’ll need to use the camera feature on your Gummiphone. This can be done by pressing the touchpad on your PS4, or the Change View button on Xbox One. After you’ve done this, you’ll need to align the square box over the Lucky Emblem and snap a photo. Note you can zoom in and out using the left and right trigger buttons if you’re too close, or too far away. 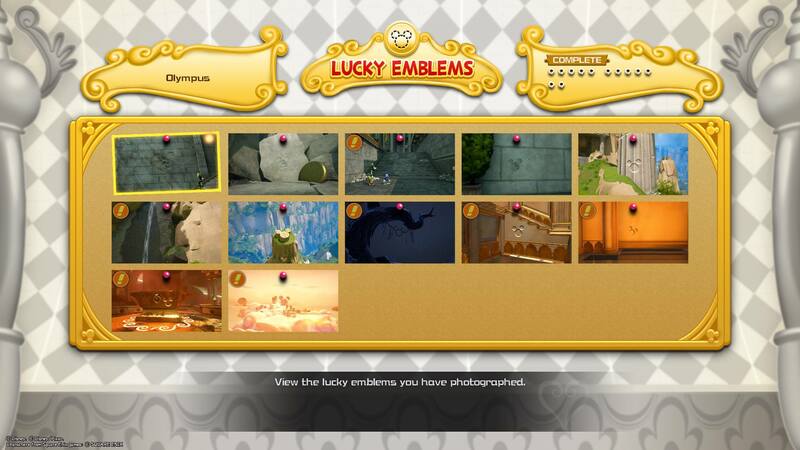 To help get you started on your Lucky Emblem hunt, we’ve listed where to find all 12 Lucky Emblems found in Olympus down below! The first Lucky Emblem in Olympus can be found on the side of a waterfall within the Cliff Ascent section of the map. Starting from the Cliff Ascent section at the beginning of the game, you’ll find your first Lucky Emblem on the side of a waterfall after you defeat the nearby Heartless. To find it, you'll want to climb up the first waterfall section, then head right up the mountain instead of left (though both will lead you to the top). The second Lucky Emblem in Olympus can be found by looking down over the side over the side of a cliff to spot the large Lucky Emblem below. Before you reach the dark, stormy section of Cliff Ascent, look back down over the mountain. There, you should be able to spot a Lucky Emblem on top of a small cliff. If you don't see it, head up a little bit more and to your left. 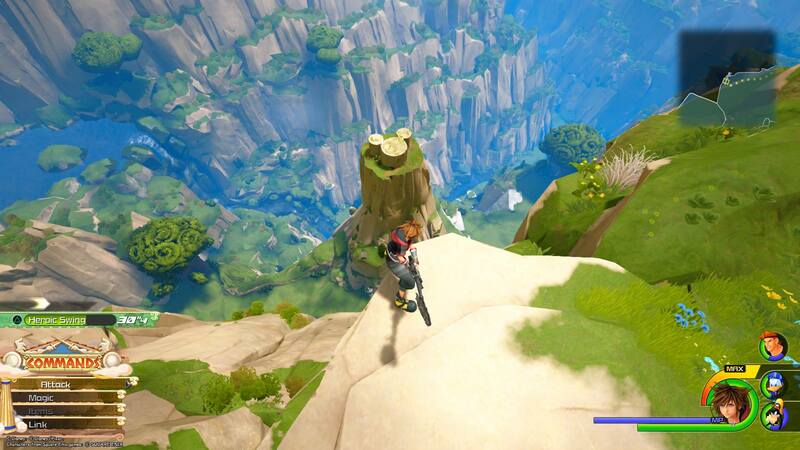 The third Lucky Emblem can be found by inspecting some of the standing pillars at the top of Cliff Ascent in Olympus. Near where you found the previous Lucky Emblem are a few standing pillars. On one, you should see another Lucky Emblem. In the dark, rainy area of Cliff Ascent, look at the shadowed trees and in one you should spot the fourth Lucky Emblem in Olympus. As you reach the dark, rainy area of Cliff Ascent, it can be a challenge to see things. 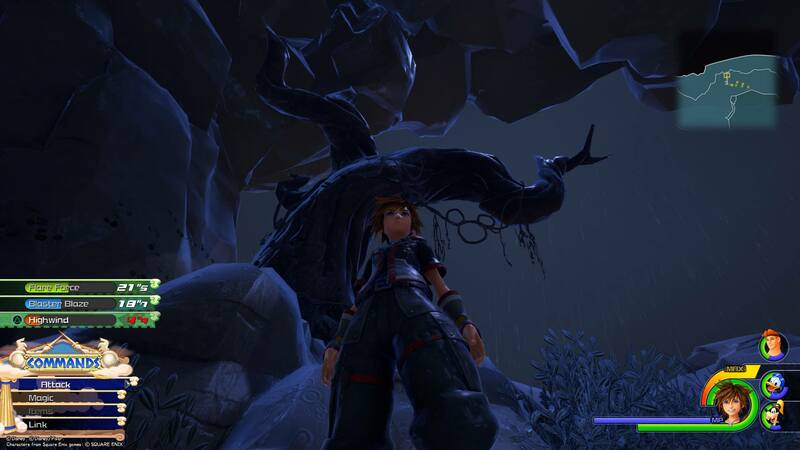 However, near one of the Heartless spawns is a dead tree, and in that tree is the fourth Lucky Emblem. 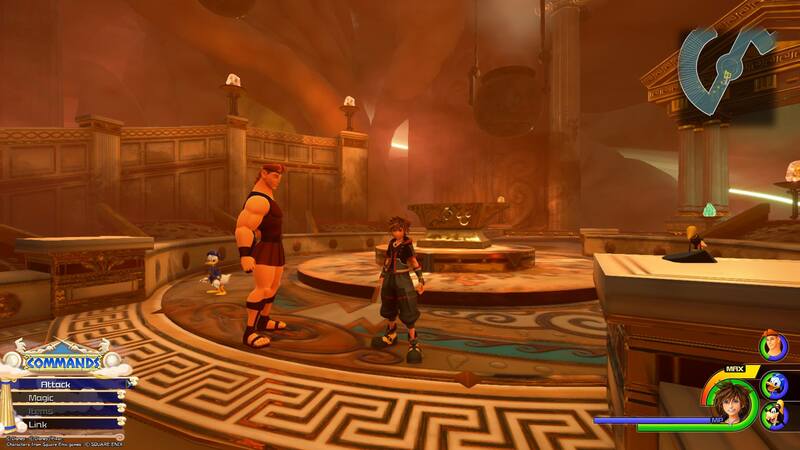 The next batch of Lucky Emblems can be found in Thebes, which has been restored from the first time you encountered the city at the start of Kingdom Hearts 3. With Thebes restored, head to the Agora and look for a building at the very back with two sets of stairs on either side. 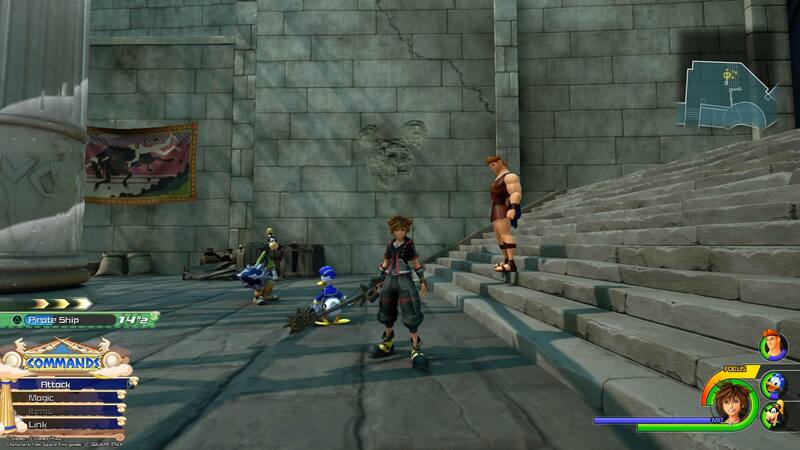 Stand against the front wall, then look at the stairs on your right to spot the next Lucky Emblem. In an area previously consumed by fire, search around the rubble and you'll find the sixth Lucky Emblem in Olympus. Continue to investigate the Agora area and surrounding buildings. On your way to the gardens, you’ll be able to explore more of the area that was previously consumed by fire at the start of the game. Here, you’ll find the sixth Lucky Emblem. Etched onto one of the walls in Thebes is the seventh Lucky Emblem in Olympus as seen in this image. Back in the courtyard, there’s a Lucky Emblem carved into the wall. It may not look like a Lucky Emblem from a distance, but when you approach it and open your Gummiphone’s camera to take a picture, it’s confirmed as a Lucky Emblem. Surrounded by four large bushes, this Lucky Emblem can be found by climbing one of the tall buildings in Thebes. Keep climbing the stairs near where you found the previous Lucky Emblem and you’ll eventually spot another Lucky Emblem on a wall near some bushes. Before you slide down the waterfall towards the forge, take a look at a small set of stairs. On the side, you should spot the ninth Lucky Emblem in Olympus. As you make your way to the Corridors of the Realm of the Gods, there's a small set of stairs before a moving waterfall area. Before you climb the stairs, look at the side and you should spot the ninth Lucky Emblem in Olympus. 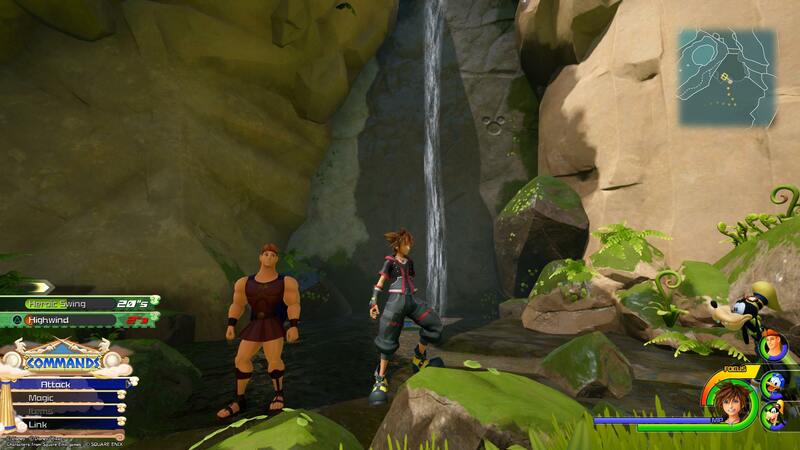 Fall over the edge of the waterfall and you'll discover a hidden forge area and the tenth Lucky Emblem in Olympus. In the waterfall section, if you allow yourself to be carried over the edge of the waterfall, you'll fall down into a hidden forge area. In the center of the forge is a large, golden anvil. Prominently displayed on the anvil is the tenth Lucky Emblem in Olympus. There's also a hidden Treasure in this area to collect. Once you return to the Realm of the Gods from the forge, continue through the buildings and after a brief fight with the Heartless, smash the pots along the wall to reveal the eleventh Lucky Emblem in Olympus. Once you exit the forge, continue to make your way through the Realm of the Gods. 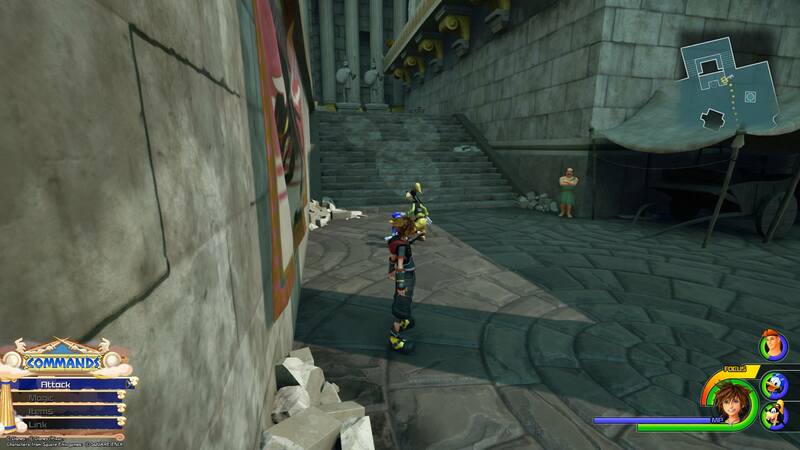 After your next Heartless encounter inside a building, look for two breakable pots along the wall. By breaking these pots, you'll reveal the next Lucky Emblem etched into the wall. The final Lucky Emblem in Olympus can be found in Cloud Ridge. The last Lucky Emblem can be found in an overlook area called Cloud Ridge. 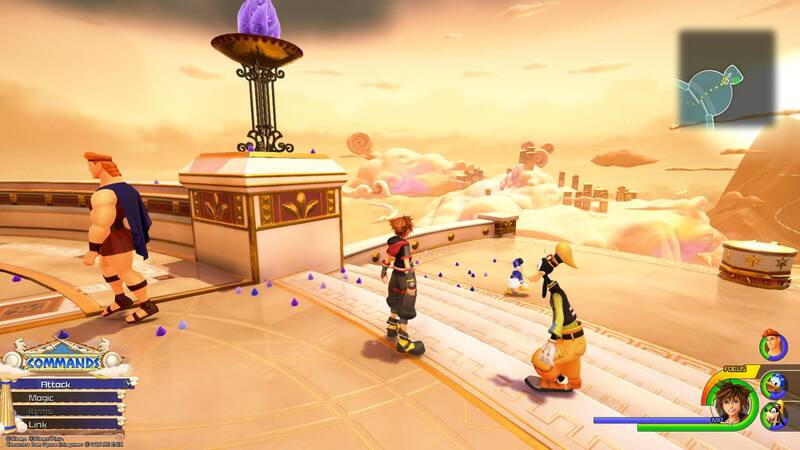 In the image above, you can see it in the sky from the highest point in Kingdom Hearts 3 where Zeus is hanging out. Unfortunately, your Gummiphone can't identify it from here. Instead, you'll need to go the area before you ascend up to Zeus. There, you'll find another rail which you can glide over, shoot some Heartless, then land in the secret Cloud Ridge spot. Defeat another group of Heartless, then stand at the edge and look at the clouds. In doing so, you should be able to capture and collect the final Lucky Emblem in Olympus! By finding and photographing all 12 Lucky Emblems in Olympus, you’ll be that much closer to unlocking the secret video for Kingdom Hearts 3. Additionally, the game rewards you when you reach Lucky Emblem milestones like 20 Lucky Emblems captured. So, were you able to find all 12 Lucky Emblems in Olympus? Which was the hardest Lucky Emblem to find? Let us know down in the comments below! 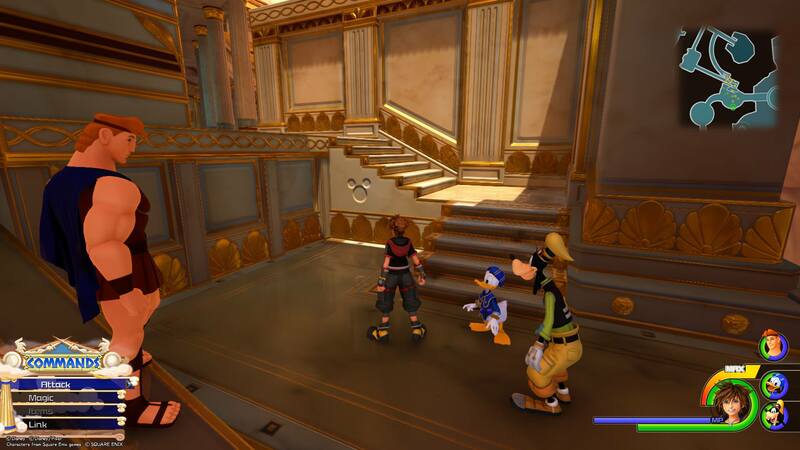 For more on Kingdom Hearts 3, be sure to check out some of our previous guides including the complete world unlock order in Kingdom Hearts 3, how to get the Ultima Weapon keyblade in Kingdom Hearts 3, and where to mail Postcards in Kingdom Hearts 3.